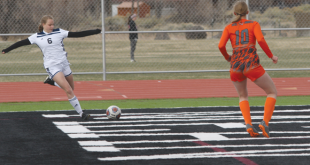 West Elk Wolverines U19 girls head coach GJ Santelli knew the team would suffer this season as a result of a short bench, and that fear came to light in the opening weekend of play. While the Wolverines rolled right through Colorado Select U-19 7-1 early Saturday morning, December 3, tired legs got the best of them in the second game that day as they ended up tying that same Colorado Select team 2-2 later on Saturday. “They got tired,” says Santelli. The Wolverines had just 11 players for the two-games, including just five wingers and three on defense, but that didn’t seem to faze them in the first game. In fact, the only thing that did faze the Wolverines was the 7:30 a.m. start, but once they wiped the sleep from their eyes and focused on the task at hand, they dominated most of all three periods. “It took a little while for them to get going and then, all of a sudden, they just started playing great,” says Santelli. Kendl Santelli put the Wolverines on the scoreboard three minutes into the game off an assist from Kathryn Guerrieri. Colorado Select struck back a minute later but the Wolverines then proceeded to rattle off six unanswered goals throughout the rest of the game. Bryar Robbins scored nine minutes into the first period for a 2-1 Wolverines lead and then Guerrieri, Izzie Dethloff and Robbins all netted goals in the second period for a 5-1 advantage. Guerrieri and Santelli each tacked on their second goals of the game in the third period as the Wolverines skated to the 7-1 win. The Wolverines then had the task of refueling for the rest of the morning before returning to the ice that afternoon to face Colorado Select again. This time, tired legs prevailed as the Wolverines struggled to dictate the pace of the game. The game started off well for the Wolverines, jumping out to a 2-0 lead on a power play goal by Sierra D’Aquila four minutes into the game, followed by a strike from Jaden Cavarra two minutes later. Colorado Select responded to net one later in the first period, and then once the excitement wore off, fatigue set in on the Wolverine skaters. That fatigue was further exacerbated as a handful of the Wolverines’ stronger skaters had to jump on the ice for penalty kill situations as well. The Wolverines successfully killed off all three penalties in the second period but as time wore on, the West Elk team wore down and Colorado Select scored in the final minutes of the third to finish the game in a 2-2 tie. The weekend was far from a complete loss though and Santelli is pleased with the outcome overall with a win and a tie on the road. “Three points on the road is good,” says Santelli. In addition, there appears to be some relief in sight for the team as Santelli is looking to pull a couple of solid younger players up onto the U19 squad throughout the season. “That will definitely help us on the front line of the bench,” says Santelli. 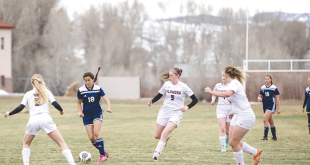 A handful of the Wolverine players are headed to play in a tournament this weekend and the team returns to league play next week when they host Steamboat Saturday and Sunday, December 17-18 in Gunnison. Games are at 8 p.m. Saturday and 12:30 p.m. on Sunday.